Wheelchair accessible from Smithfield Street entrance. Isaac Hobbs of Philadelphia, a specialist in ornate residential architecture, designed the bank in the late 1860s. 14,000 tons of brownstone and pink granite were used during the construction of this grand Beaux Arts structure, which set the standard for subsequent banks constructed along Fourth Avenue. During your visit, be sure to explore the bank's historic board room with its ornate hand-carved Brazilian rosewood trim and molding. Visitors are also welcome to tour the basement, with its 1930s art deco bank vault and custom-made steel-beam supports for the Kohler lions one floor above in the main hall. The oldest surviving bank structure on Fourth Avenue, this Beaux Arts beauty has been continuously owned and operated by Dollar Bank since the building opened. The center portion of the building was designed by Philadelphia architect Isaac H. Hobbs and built in 1870. Its façade contains more than 14,000 tons of brownstone quarried in Portland, Connecticut. The original lions, carved on site by Max Kohler and his assistant R.C. Morgan, sat outside the building from 1871 – 2009, when they were removed for restoration and afterwards placed inside the main banking hall. Two new lions, exact replicas of Kohler’s original pair, hand-carved from Berkshire Brown stone by Nicholas Fairplay and Brian C.E. Baker of Oberlin, Ohio, were installed on the building in 2013. As Dollar Bank grew in the latter 1800s, the building was expanded in 1896 and 1905. The architect for the 1905 project, in which wings and skylights were added, was James T. Steen, a Pittsburgher, who had been a Dollar Bank customer since 1868. The banking hall contains original 19th-century marble and stained glass, and the building’s original wooden doors (weighing approx. 1800 pounds each) are mounted inside the vestibule at the Fourth Avenue entrance. 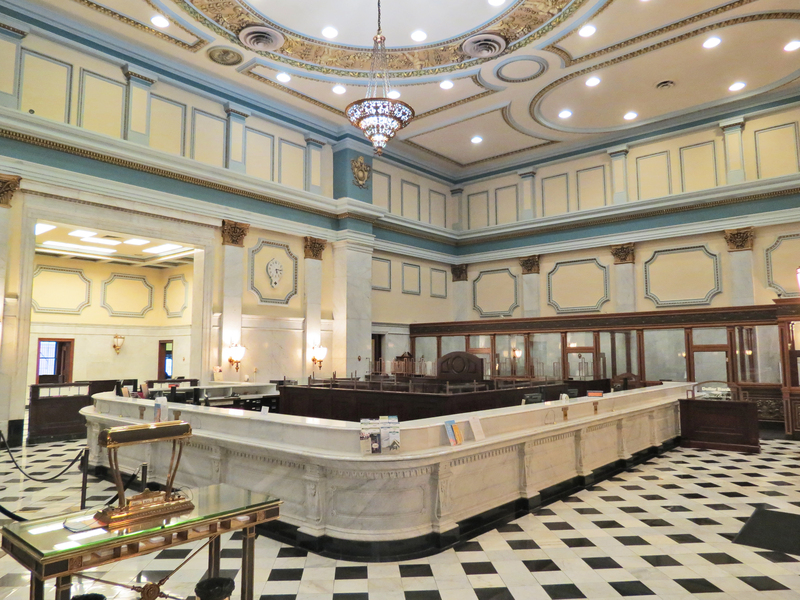 The Heritage Center is a must-see, where you can view handwritten ledgers, vintage banking machines and other artifacts from Dollar Bank’s Archival Collection.